At Soft Touch Dentistry, we pride ourselves on our top quality porcelain veneers that look and feel like natural teeth. Dr. Sarah Thompson is extensively trained and qualified to perform a full range of cosmetic dental services, including veneers. We are a family dental practice that recognizes the importance of your smile; it has the ability to convey beauty, success and confidence to those around you. Our practice serves patients in O'Fallon and the surrounding communities of St. Louis and has a dedicated team of professionals who are passionate about delivering state-of-the-art dental care in a warm, stress-free environment. Whether you choose porcelain veneers to restore a smile you once had or to create the smile of your dreams, we can help you at Soft Touch Dentistry. 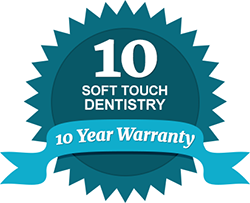 At Soft Touch Dentistry, your comfort is our priority. Our dental veneer specialist will help you feel at ease the moment you walk through our doors. Not only do we offer relaxing amenities and chair side patient education videos, but Dr. Thompson is also among the elite 5% of dentists in America that is licensed to perform IV Sedation. If you are currently unhappy with the appearance of your smile, contact our dental office today. Our practice offers flexible payment options and excellent financing plans for your benefit. We look forward to helping you create the brilliant and confident smile you deserve!